Compaction Plus stocks new and used recycling equipment such as various sized Balers and Compactors. 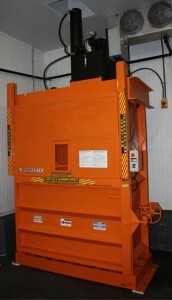 We also have many other unique pieces of used waste and recycling related equipment. If we don’t have it we usually can find it for you. Buy "as-is", reconditioned, or new. Install yourself or have us do it for you. Contact us at 905.878.3400 for up-to-date inventory and pricing. Custom designs or modifications possible. Below is our current baler special. Perfect for baling medium volumes of Old Corrugated Cardboard or Stretch Wrap and Plastic film. Units are less than 5 years old and in excellent working condition. All units are 110 plugs in outlet. Shipping can be billed extra or you can arrange your own pick up from our warehouse in Toronto.